Add this bird motif cast stone fountain to your decor as a serene, natural accent. The tall, slender shape of this bird motif, Relic Nebbia finish cast stone outdoor fountain makes it ideal where space is at a premium. Bubbling water is pumped through the decorative round top piece, illuminated by an LED plume light kit to create ravishing nighttime effects. Henri Studio was started more than 40 years ago when Tuscan sculptor Eneri Prosperi came to the U.S.A. He combined master sculpting techniques with cast stone, a highly dense material with a texture similar to limestone. Made from a special cement blend of coarse and fine minerals, pigments, and water, it is enriched by exclusive finishes that convey vivid natural stone highlights in subtle organic tones. Please note this custom made-to-order design ships for free, but may require freight curbside delivery due to its size and weight. 39" high x 15: wide. Round top is 6" high x 11" wide. Weighs 169 lbs. Birds motif tall outdoor fountain. Hand-made in the USA by Henri Studio. Relic Nebbia finish. Cast stone construction. 2 pieces with birds top and sunflower basin. Includes LED accent plume light kit. Pump included. We have had a Henri Studio fountain that my husband gave me for our anniversary about 15 years ago. It finally needs to be replaced and we thought this one was really pretty. Lamps Plus had it for $100 less than anyone else! Can it plug and if so, is it 2 or 3 outlet? BEST ANSWER: This features a 3-prong plug. How does the decorative round top piece disconnect and removed to clean the bowl and disconnect the electrical connections. Also, does the chemical that descales the unit harm birds? BEST ANSWER: Hi James - I have added a link to the assembly instructions below. Please still feel free to contact one of our technicians by calling our Customer Service Department if you still need assistance. We recommend using a product called Protec which is safe for pets and animals. How much sound is produced? I am looking for something that will provide the sound of water and I want to make sure this isnt a very quiet bubbler. BEST ANSWER: Unfortunately, there is no sound rating provided by the manufacturer. But, this is designed to provide a nice tranquil water flow sound. BEST ANSWER: Hi, the lead time is 3-4 weeks. Is the water flow loud? BEST ANSWER: Hi, the water noise level in this fountain is very smooth. Due to the slight cascading effect it is too loud. Can the pump size be increased to create a taller bubbler? BEST ANSWER: Access to the replaceable pump in this fountain is simple, and different water pumps are widely available in the marketplace if you wished to increase the volume of water. However, we do not offer a specific pump for this purpose. 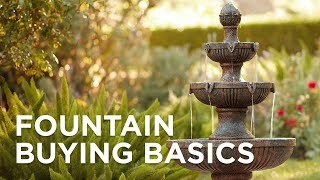 How does the light kit work and how easy is this fountain to clean? BEST ANSWER: Hi! I will send you the installation instructions directly so that you can visualize on the light works. In terms of ease of cleaning, as long as you keep replacing the water and use some kind of scale/stain treatment for the water, you will have years of enjoyment with this fountain. BEST ANSWER: It does not have the typical birdbath type shape however birds could drink from the bubbling top. BEST ANSWER: Hi! This fountain ships to you for FREE! The fountain weighs approximately 169 lbs. It comes in two pieces. The base weighs is 70lbs and the top weighs 99lbs. Does this fountain sit on a water basin that's in the ground? If not, I assume you have to keep pouring water on the top? About how much water (gallons) does it hold? How long is the electrical cord, please? BEST ANSWER: Hello Val! The basin sits on top of the pedestal. The fountain fits approximately 4-5 gallons of water and comes with a 6 foot electrical cord. I have an image that I will email you directly that may help to clarify how the fountain works. Very nice product, heavy, substantial. Boy and Girl work together to reach the spouting center of this whimsical garden fountain. The abstract design of this hand-made cast tone fountain is perfect for today&#39;s modern homes. A pair of doves make the perfect finial for this decorative cast stone fountainhand-made in the USA.